Season 1. Episode 12 with Jackie Bachteler. Listen to the podcast. Don't forget to subscribe! 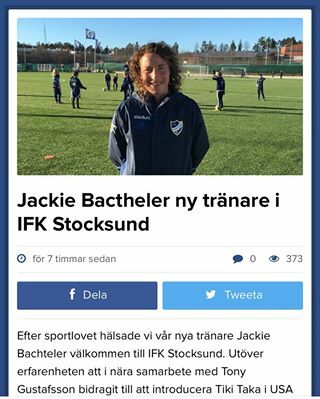 American Jackie Bachteler is an Assistant Coach for Sweden's First Division team, Hammarby in Stockholm, Sweden. Bachteler will discuss her journey as a professional player in the US and her rise to UEFA Women Champions League. Host: Let’s transition and start talking a bit more about your experience playing in leagues outside of the US. Tell us about your transition after college to other leagues. What drove your decision to move to Finland initially? Guest: My big decision to come to Finland was because they told me I could come to the team directly after I graduated. Many teams wanted me to come in January, but one of my big goals was to graduate from college. So, it was a perfect fit for me to come to Finland at this time, three days after graduation. I get to go and live my dream as a professional soccer player. The biggest transition to the league from the US is that it’s more physical, but in Finland and Sweden it’s much more tactical and the players have an overall understanding of the game, that they can outsmart the American runner. They can outsmart with different positioning, versus someone who is running without a purpose. They have more of a purpose with their tactics and more of a purpose with their movements. It’s something I’ve been studying even since I was very young, and I also watched European soccer constantly. When I went to Finland it really suited my style of play in a way because it was so tactical. It was much more technical with the technical tactical application. You take on moves for a reason. There’s more reason for why we did different things. I think a big adjustment for players when they come over here is that it’s not so physical as it is in the US, but it’s smarter in Europe when it comes to the physics. It’s a much longer season and it’s pretty intense because of the length of the season. But it’s also much smarter in every way. — Jackie Bachteler, Hammarby Assistant Coach and former pro player. Host: Right. You talked about how it’s different technically and tactically in other countries, but I think that it’s also different culturally as well. Can you talk about the differences you see culturally in the way young players approach football in the US compared to other countries where you’ve played and coached? How important do you think understanding the local culture around football is to incentivize children to pursue the sport? Guest: I think culture is extremely important. For example, the team I had in Cyprus, it was like life or death for every game. They live for this game. When I was in Spain they live for the game. In Sweden it’s what they look forward to. It’s what they look forward to, it’s always on TV. And the US you see American football, you see hockey, you see baseball, and then you see soccer. Here it’s soccer first, it’s football first. It’s fun to watch everyone playing in the schoolyard, and everyone is always with the ball. So, I think this culture of always wanting to be around the ball and always studying the game in Europe is something that we need to take to the US even more. We need to take it to another level. And also, that it’s OK to focus on development. How can I develop in the best way, rather than winning? It’s development to win in the long run. But in many places in the US it’s more on winning now. Host: Right. That’s exactly right. We see it as well. You’ve seen and you’ve coached in a lot of different countries. With that experience what can you tell us about the level of play that you’ve seen in other countries, particularly in Spain as well. Let’s focus on youth with this question. What do you see at the youth level as the difference in level, say in Spain or other European countries versus the US? Guest: I am seeing in Spain and Sweden, especially, is the speed at which they can make decisions. It’s increasing rapidly over here especially in Spain. I think you’ll see in a few years that country on the women’s side will completely take off. But the ability to take decisions at a high speed is increasing, and to take the right decision. It’s not just following a pattern it’s also following the principles. They are able to adapt in different situations and adapt quickly. So I think the big key is match-like situations with a high degree of decision making. Players are extremely great at the youth level at making decisions. And adapting to different types of play, and focusing on tactics at a young age, tactics for development. Host: Absolutely. I think that it seems like sometimes here in the US kids are at a bit of a disadvantage. I don’t know if it’s cultural, or what the source is, but it seems that sometimes kids here in the US aren’t always willing to pay their dues if they have the dream of playing soccer professionally. What do you think it will take to get the US to make the shift where children will have that drive and be willing to do whatever it takes to be a professional? Guest: I think a big thing now not just with US but with many players, is to let go of your ego a little bit. You have to think about "Where can I develop at this time?" A lot of Americans, when they come over here to Sweden, they seem a little disappointed. Maybe their locker room in college was much better than what they have here. They expect a different professional environment but if they look into the football it’s much better. If they look at the soccer here it’s a much, much better environment to develop for these type of players. So you have to look at where to develop best for my next spot. I went from a Division II team here in Sweden to train with some of the best players in the world in under a year. It’s important that you do pay your dues. You have to come and take a chance. The most important thing is to come here and get seen, even if it’s a Division II or Division I team. Once you’re here, eyes are going to be on you, you will be seen and it’s your chance to show. My advice is you have to let down this ego and go to a place where you will develop in the best way and develop towards your goal. You have to do whatever it takes to become that dream even if it’s starting with the Division II team like I did. A lot of times you don’t come to the top league in a country right away, you have to climb the ladder. You have to prove yourself before you can get there. Host: And you have to do your homework to right? Even before you look at going to foreign leagues, you have to understand who it is you want to pursue. Who can put you on the best path? That has to be part of your experience too, right? Tell us a little bit about that as well. Guest: Exactly right. You have to know what is the best. You can look at the culture and ask what culture will fit me best? Am I going to be OK to be in Finland when they don’t speak the same language as me? Will I feel comfortable on the field as well? That’s extremely important because when you come you’re going to be pretty alone. These players have their own lives of the field. You do have your team, but it’s a very different from college. It’s not everyone on one campus who are going to be friends for four years. It’s players who really do have different lives or a job, because they love it as well. But it’s a very different career in a way. It’s important that you know what the team will expect of you, how they will help you and how you help them come to the best place. Will this be a good fit for you? Will this help you develop and get seen at the next level that you’re about to pursue? Host: That’s right. And for US players who, like you, choose to play abroad, do you see opportunities for players to, when they go abroad, to build a support system locally? You touched on that, but how important is it for them to build that support structure at the local level when you’re playing outside the US? Guest: It is extremely important. I tell players when they come here, you have to come out of your comfort zone off the field as well to meet new people. With today’s technology it’s pretty easy, Americans in Sweden, Americans in Spain can find Americans there in similar situations. You can find people in your team, you can go out and meet people, but I think it’s very important to have a support system here, so you feel good as well off the field. I’ve gotten pretty lucky here in Sweden because I have many Swedish players that I studied with in Florida, and they are some of my best friends, and they all live in Stockholm, or very close to Stockholm. I have my little Swedish family here as well. I’ve had that support all my years from when I came to Finland. Even though they weren’t in Finland I always knew they were there and was only a flight away. So that really helped me a lot to have a support system. It’s really important to create it on your own and it makes it even more special to create a bond over here. Because you have to create your own little European family when you come over here. Host: That’s right. I think that’s difficult for some people, but I think it’s a key component to being successful at playing abroad. The other thing I wanted to talk a little bit more about, or have you touch on, is talk about the importance of adjusting to the European level and how it differs from the level here in the US. Guest: You have to be open to the Swedish way if I can give the example. If I’m coming here to play in the Swedish league I can’t compare so much to the US. I have to learn what can I learn from them. What can I give to them as well? Some people I hear a lot say, “We do this in the US, we do that.” But now you’re in Sweden. How can you adapt to the Swedish league? How are they playing in Sweden? They are very defensive, they are very good in their defensive tactics and very strong. How can I take that into my game for example? How can I take this and also add what I have, my strength, that they have brought me in here and put it into their system? EPISODE 5-PMA FOR FOOTBALL GREATNESS discussing the importance of Positive Mental Attitude for American players hoping to succeed in European leagues. EPISODE 9- DOMESTIC/ABROAD? STRATEGIC THINKING TO PLAYER DEVELOPMENT. Discussing Sunderland's experiences as a father of a players competing in Spain as well as a TD for an MLS Academy. EPISODE 7 A PATHFINDERS PERSPECTIVE Hayden discusses his experience growing up in Spain and what it is like to live the dream of an early career footballer.